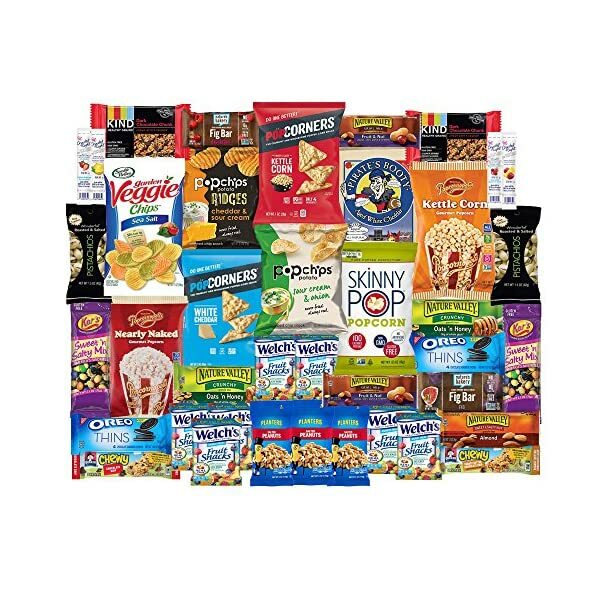 HEALTHY SNACKS: Canopy Snacks Bundle of 30 items! Veggie sticks, Popcorn, Granola Bars, Fruit Snacks, and More!! 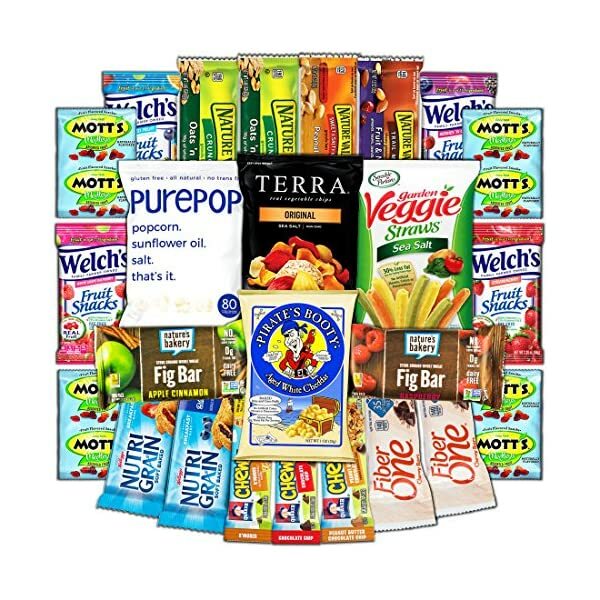 ✓ PREMIUM NATURAL PACK - This pack has a mix of many snack brands like Welch's, Quaker's, Nature Valley Bars, Planters & more. 100% fresh, tasty and healthy ingredients. Great for men and women, kids or adult, a perfect snack in the morning or after workout or whenever you feel little hungry. ✓ CLASSIC TASTEFUL FLAVORS - Everyone has their own favorite! 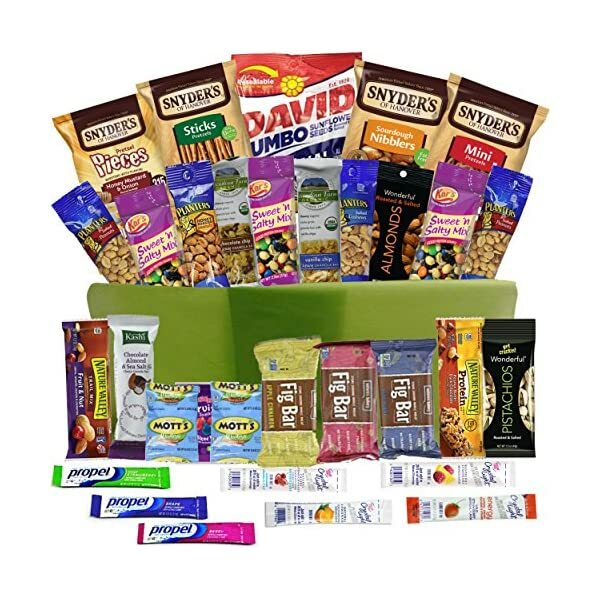 This pack contains; oats and honey, peanut butter, dark chocolate, veggie chips, pop corners, skinny pop, Welsh's fruit snacks, beliVita blueberry, CLIF bars, roasted and salted peanuts, Kind bars, Diamond almonds, Quaker's chew, Quaker's chewy dipps. 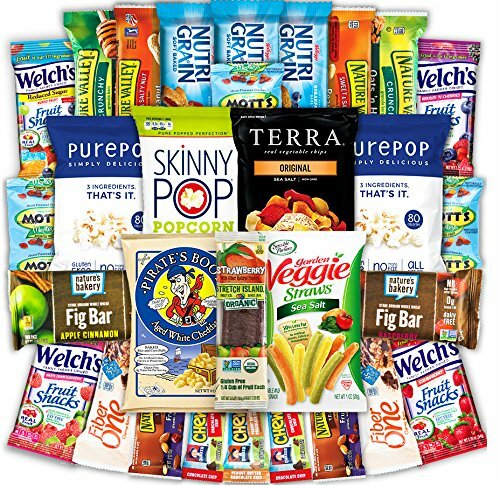 ✓ BEST FAST SNACK FOOD - These Bars is easy to bring with you fits in your pocket or bag easily. Great for students, workers, fishing, hunting, camping or if you're on travel. Also makes a great gift for anyone in your life. DISCOVER THE ULTIMATE HEALTHY Mixed Cookies, Crackers PARTY AND MEETING SET! - If you like healthy, crunchy and mouth-watering mixed Cookies and Crackers, then you will absolutely love this all-inclusive mixed bars gift pack by Veratify! 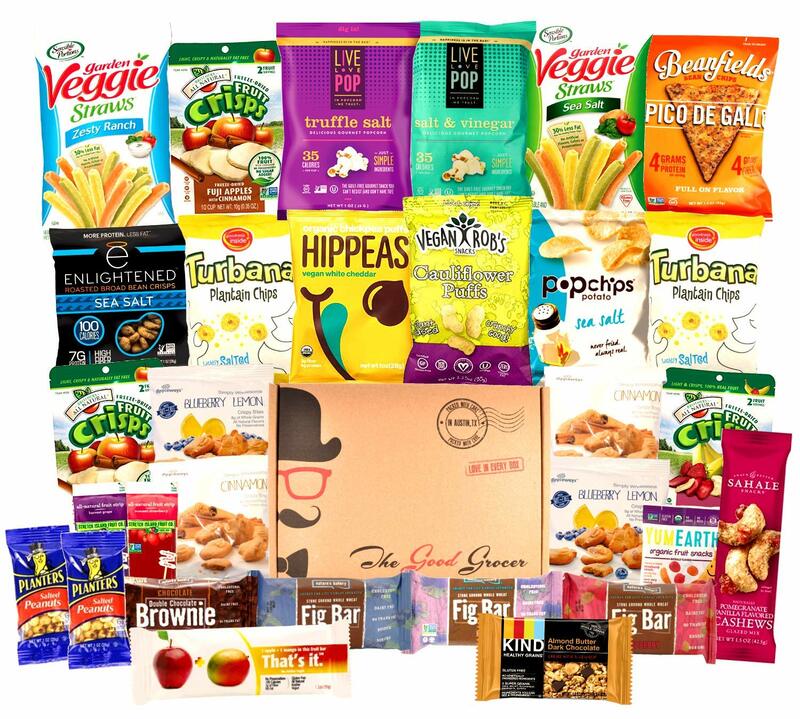 ONE SNACK KIT, 30 DIFFERENT EXPERIENCES! - Are you always looking to explore new flavors? The Veratify comprehensive mixed Cookies and Crackers party pack includes 30 different, individually sealed, Cookies and Crackers varieties for you to enjoy! Whether you like peanut butter, chocolate chip, we've got you covered! THE IDEAL SNACK FOR EVERY OCCASION! - Our nutritional mixed Cookies and Crackers are the perfect snack for any occasion! Just pop the packets and make your movie night, sports night, party, office break, picnic, camping trip, road trip or business meeting fun and crunchy! 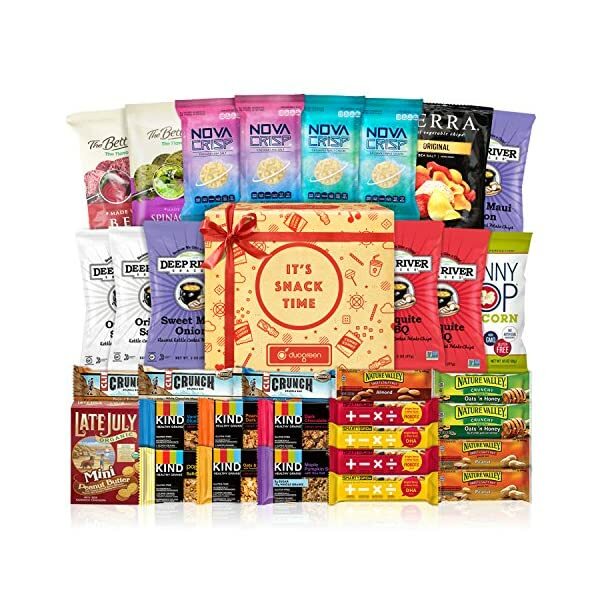 PERFECT GIFT FOR A HEALTHY DIET: Our All Natural Healthy Snacks Care Package is a collection of 30 grab-n-go snacks that you can feel good about. 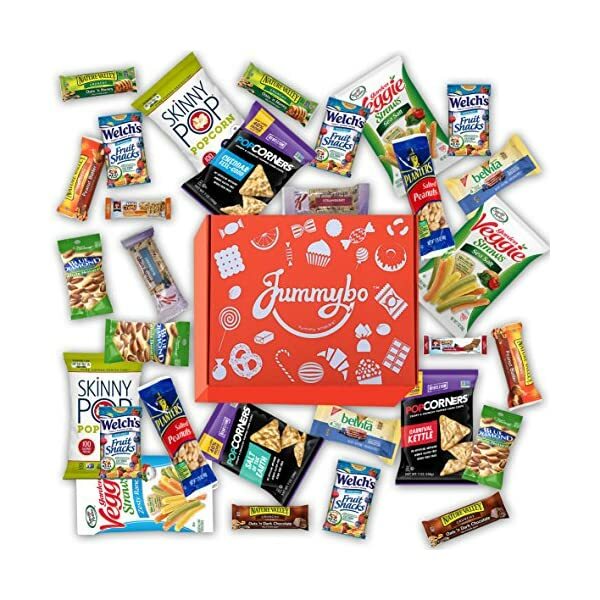 This healthy snack box includes a mix of yummy savory and sweet snacks that everyone will love. BEAUTIFULLY PACKAGED: Snacks come packaged in our awesome gift box. It's really cute and earth-friendly too! All of our boxes are made from 100% recycled materials. Expertly packed with care in The Good Grocer gift box. GUARANTEED FRESHNESS - All of our snacks are guaranteed to have expiration dates at least 50 days. 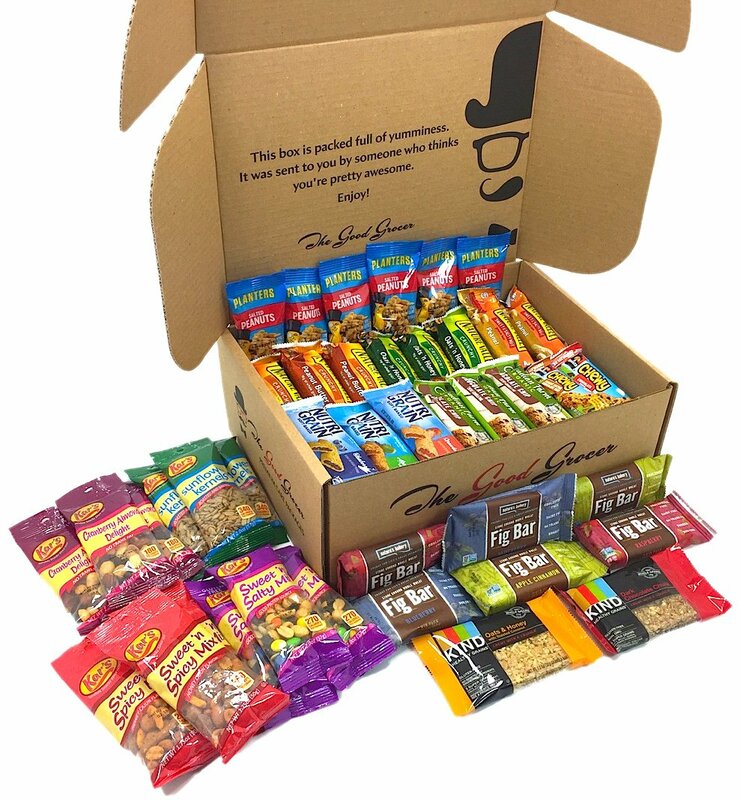 Expertly packed with care in our gift box, this collection of premium snacks is sure to satisfy and delight anyone. Healthy Snacking, Healthy You! 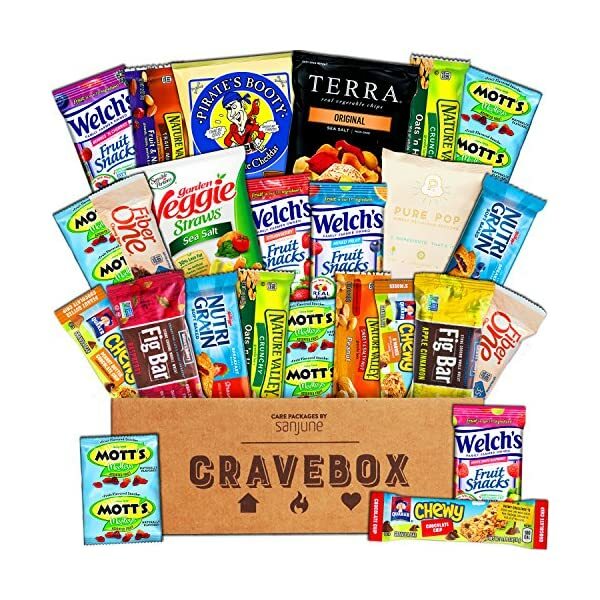 Catered Cravings offers the perfect variety pack for healthy snacking. Your taste buds will never get bored again. 32 individually wrapped items to choose from means the recipient will be in awe of the large choices they have before them. 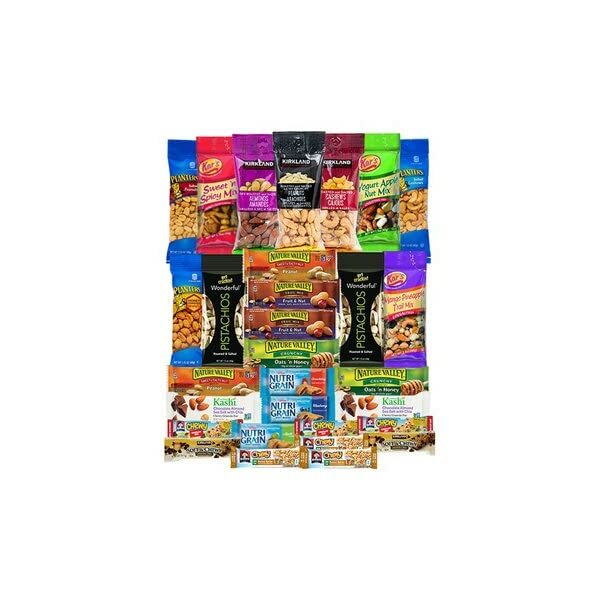 Includes Drink Mixes, variety of Nuts including Pistachios, Trail Mixes, Granola Bars, Protein Bars, Sunflower Seeds and more. Gift boxes will be consistent, you will get what you see in images and read in the description. You will know exactly what you are sending every time. 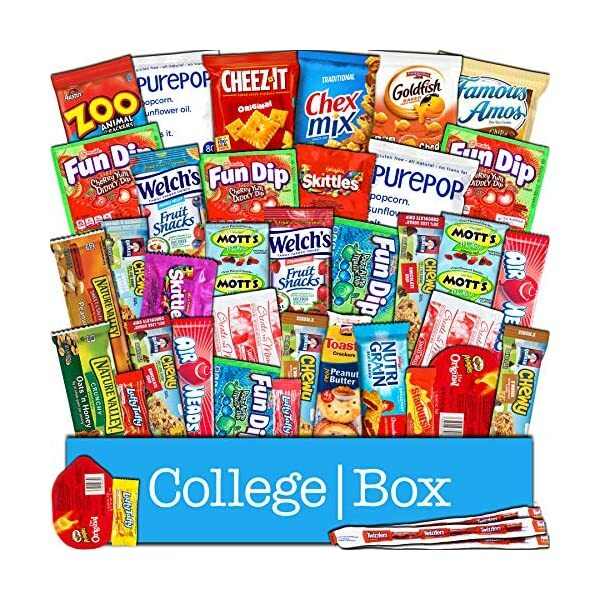 Includes a 6 quart Re-usable Snack Bin carefully packed full of the best and most loved healthier snacks on the market. Each bin will be shrink wrapped for safe travels. All products are guaranteed fresh! No stale or expired products. You will receive the best quality fresh product. 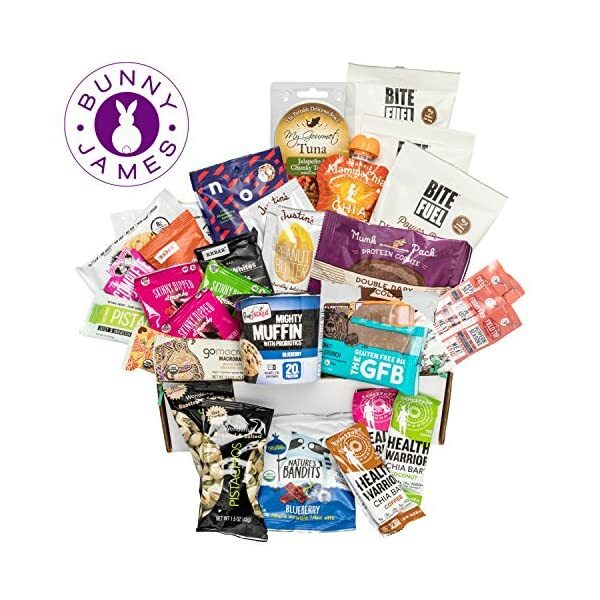 HEALTHY HIGH PROTEIN SNACKS GIFT BOX: The Bunny James Fitness Box (30 Count) is the ultimate healthy snack assortment filled with 30 full size individually wrapped single serve nutrition snacks. 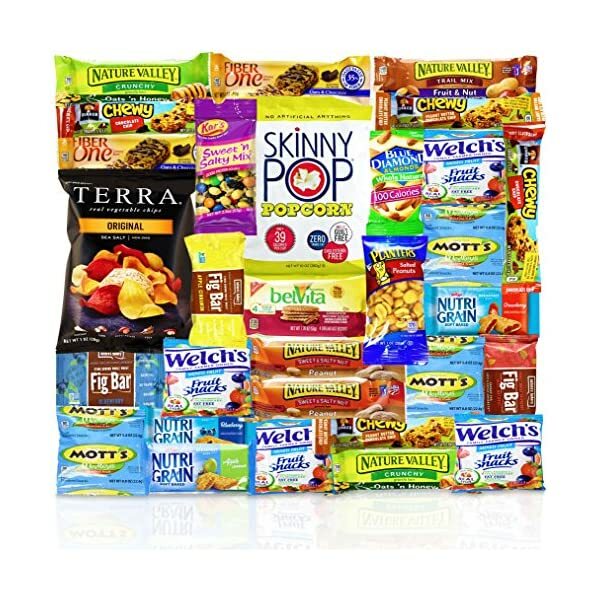 VARIETY SNACK PACK SAMPLER BOX: Amazing variety of delicious grab & go meal replacements, energy snacks, and low sugar treats. 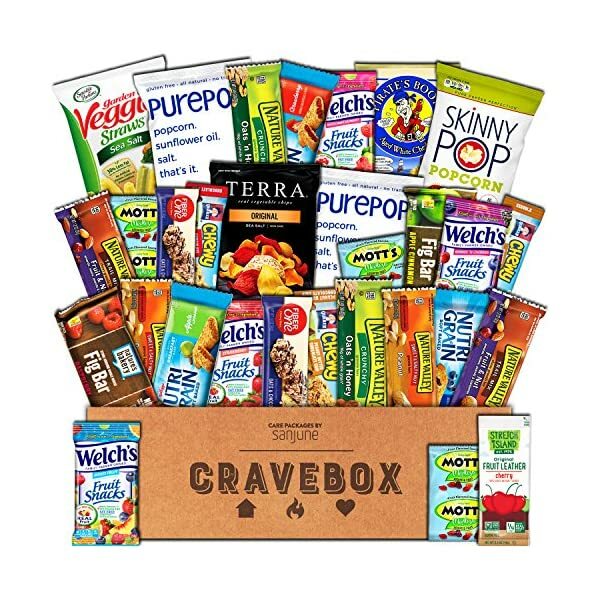 this is ideal workout care package- no fluffy chips in this box.